The George R. Moscone Convention Center (pronounced /mɒsˈkoʊni/), popularly known as the Moscone Center, is the largest convention and exhibition complex in San Francisco, California. The complex consists of three main halls spread out across three blocks and 87 acres (35 ha) in the South of Market neighborhood. The convention center originally opened in 1981. It is named after San Francisco former mayor George Moscone, who was assassinated in November 1978. Moscone South is located to the south of Howard Street. It is three stories tall. It opened in 2017, replacing the original Moscone Center building that opened in 1981. A Keith Haring sculpture stands outside the hall at the corner of 5th and Howard streets. Moscone North is located to the north of Howard Street. Moscone West is a three-level exhibition hall located across 4th Street from Moscone North. Moscone North and South are connected by a pedestrian bridge over Howard Street, as well as by the underground exhibition hall, which extends far beyond the aboveground structures and beneath Yerba Buena Gardens and the Metreon entertainment center. The massive underground hall has been described as a bunker. Together, Moscone North and South have 504,000 square feet (46,800 m2) of contiguous exhibition space, two ballrooms, 82 meeting rooms, and 107,000 square feet (9,900 m2) of pre-function lobby space. 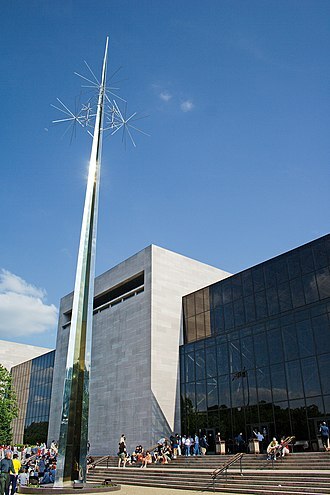 A large solar electricity system was installed on the roof of the center in March 2004 by PowerLight Corporation. The installation of this system marked San Francisco's first major step towards obtaining all municipal energy from pollution-free sources. With the 60,000-square-foot (5,600 m2) solar array (675 kW capacity) in place, San Francisco boasts one of the largest city-owned solar installations in the country. The electricity generated by the solar system, combined with savings from energy efficiency measures, delivers the equivalent energy to power approximately 8,500 homes. The location of the complex in the South of Market area provides easy access to downtown San Francisco's many hotels and restaurants, as well as major transportation systems. The center is two blocks away from the Powell Street station, which is served by both BART and Muni Metro. 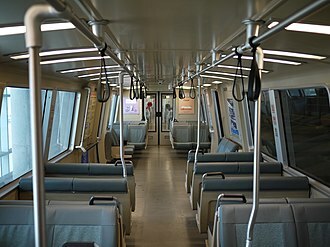 When complete, the Yerba Buena/Moscone station will also bring Muni Metro service to the southwestern corner of the convention center complex and provide connectivity with Caltrain. An Amtrak Thruway Motorcoach stop at Moscone Center (station code SFM) also transports riders to the Emeryville Amtrak station along the Capitol Corridor line. 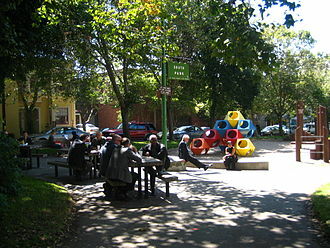 The South of Market Area where Moscone Center was built was claimed by the San Francisco Redevelopment Agency, and a protracted battle was fought by the displaced low-income residents during the 1960s and 1970s. Although the Center is named after the murdered mayor, Moscone initially opposed the development of the area when he served on the SF Board of Supervisors in the 1960s because he felt it would displace elderly and poor residents of the area. As mayor, Moscone convened a special committee of proponents and opponents of a convention center. Hearings were held throughout SF seeking citizen input. A compromise was reached which was supported by Moscone. He put the matter on the ballot in November 1976 and it passed overwhelmingly. The original Moscone Convention Center hall opened in 1981 on the site of what is now known as Moscone South. It was designed by a team at Hellmuth, Obata & Kassabaum led by Bill Valentine. The exhibition hall was placed underground to minimize the controversial convention center's visible footprint. Moscone Center was featured in the 1995 movie The Net, with Sandra Bullock. The expansion of Moscone North and Moscone West in 1992 and 2003, designed by Gensler with Hunt Construction Group as the general contractor, added an additional 600,000 square feet (56,000 m2) to its original 300,000 square feet (28,000 m2) of exhibit space. Moscone North and South underwent a two-year renovation project completed in 2012. The renewal project was designed by HOK, the center's original architect. A $551 million expansion project is underway, scheduled for completion in December 2018. The aboveground portions of Moscone South have been demolished and replaced by a more spacious structure. Moscone North was also renovated. The expansion project was designed by Skidmore, Owings & Merrill in collaboration with Mark Cavagnero Associates. Moscone Center hosts many large events each year. During the 2016–17 season, Moscone Center hosted 74 events with a total attendance of 1,021,031. In addition, Moscone Center hosts public gated events such as the SF Auto Show and the Fancy Foods Show. ^ a b Epstein. E. (February 13, 1996). Moscone Expansion is Part of Trend, San Francisco Chronicle. ^ a b c d e f King, John (September 11, 2017). "New Moscone Center strives for elegance amid enormity". 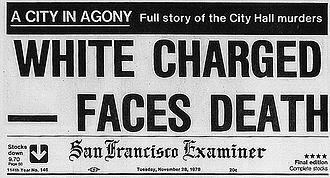 San Francisco Chronicle. Retrieved June 10, 2018. ^ "Meeting Agenda, Budget and Finance Sub-Committee" (PDF). City and County of San Francisco. April 13, 2017. p. 3. Retrieved April 9, 2018. ^ "The Moscone Center Expansion" (PDF). Moscone Center. May 3, 2018. p. 2. Retrieved June 10, 2018. ^ "Moscone Center : Contractor Guidelines". www.moscone.com. ^ Hartman, Chester. 1974. Yerba Buena: Land Grab and Community Resistance in San Francisco. San Francisco: Glide Publications. ^ Hartman, Chester. 1984. The Transformation of San Francisco. Totowa, NJ: Rowman & Allanheld. ^ "Attendance & Utilization". Moscone Center. Retrieved June 10, 2018. ^ Goh, Gabey (October 5, 2016). "Dreamforce 2016 kicks off in San Francisco". Campaign Events Impact. Retrieved June 10, 2018. ^ Oracle OpenWorld San Francisco 2008 (PDF). Oracle OpenWorld. San Francisco: Oracle Corporation. September 21–25, 2008. p. 9. Retrieved June 10, 2018. ^ LaPedus, Mark; Clarke, Peter (May 27, 2004). "Semicon West to move into one venue in 2005". EE Times. Retrieved June 10, 2018. ^ Day, Bill (May 1, 1997). "Java grows up". JavaWorld. International Data Group. Retrieved June 10, 2018. ^ McKenzie, Cameron (September 2017). "JavaOne 2017 walks a new path". TheServerSide. TechTarget. Retrieved June 10, 2018. 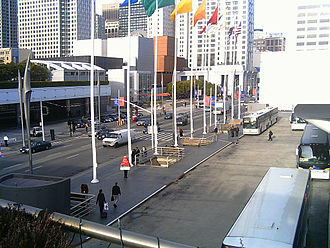 Wikimedia Commons has media related to Moscone Center. The Apple Worldwide Developers Conference, is a conference held annually in California by Apple Inc. The conference is used by Apple to showcase its new software, attendees can participate in hands-on labs with Apple engineers, and in-depth sessions covering a wide variety of topics. WWDC began in 1983 in Monterey, until 2007, the number of attendees varied between 2,000 and 4,200, during WWDC2007, Steve Jobs noted that there were more than 5,000 attendees. The WWDC events held from 2008 to 2015 were capped, since 1998, the conference has generally started with a keynote presentation. It was usually delivered by Jobs, resulting in their becoming termed Stevenotes, after Jobs 2011 resignation and death, his successor Tim Cook delivered the keynotes. In 1991, first public demonstration of QuickTime, in 1995, WWDC95 focused almost fully on the Copland project, which by this time was able to be demonstrated to some degree. Gil Amelio stated that the system was on-schedule to ship in beta form in summer with an initial commercial release in the very late fall. However, very few live demos were offered, and no beta of the system was offered. In 1996, WWDC96s primary emphasis was a new software component technology called OpenDoc, the OpenDoc consortium included Adobe, Lotus and Apple. Apple touted OpenDoc as the foundation for application structure under Mac OS. In 1997, WWDC97 was the first show after the purchase of NeXT, the show focused mainly on the work in progress, including a short history of development efforts since the two development teams had been merged on February 4. Several new additions to the system were demonstrated, including tabbed and outline views. Under the original Rhapsody plans, classic applications would run in sandboxed installation of the classic Mac OS, to receive new features, such as protected memory and preemptive multitasking, developers had to rewrite applications using the Yellow Box API. Developer complaints about the major porting effort to what was a market and warnings that they might simply abandon the platform. Caltrain is a California commuter rail line on the San Francisco Peninsula and in the Santa Clara Valley. The northern terminus of the line is in San Francisco at 4th, extra trains were often run for special events held in AT&T Park in San Francisco, Stanford Stadium in Palo Alto, and SAP Center in San Jose. Caltrain operates 92 weekday trains,6 of which are extended to Gilroy, weekday ridership in February 2016 averaged 62,416, up 83% since 2010. Caltrain is governed by the Peninsula Corridor Joint Powers Board which consists of agencies from the three counties served by Caltrain, San Francisco, San Mateo and Santa Clara, each member agency has three representatives on a nine-member Board of Directors. The member agencies are the City and County of San Francisco, SamTrans, Caltrain has 29 regular stops, one football-only stop, and two weekend-only stops. As of October 2012 Caltrain runs 92 weekday trains,36 Saturday, the original commuter railroad built in 1863 was the San Francisco and San Jose Rail Road, it was purchased by Southern Pacific in 1870. Southern Pacific double-tracked the line in 1904 and rerouted it via Bayshore, after 1945, ridership declined with the rise in automobile use, in 1977 SP petitioned the state Public Utilities Commission to discontinue the commute operation because of ongoing losses. To preserve the service, in 1980 Caltrans contracted with SP. Caltrans purchased new locomotives and rolling stock, replacing SP equipment in 1985, Caltrans upgraded stations, added shuttle buses to nearby employers, and dubbed the operation CalTrain. The Peninsula Corridor Joint Powers Board was formed in 1987 to manage the line, San Mateo and Santa Clara Counties commissioned Earth Metrics, Inc. to prepare an Environmental Impact Report on right-of-way acquisition and expansion of operations. With state and local funding, the PCJPB bought the right of way between San Francisco and San Jose from SP in 1991. The following year, PCJPB took responsibility for CalTrain operations and selected Amtrak as the contract operator, PCJPB extended the CalTrain service from San Jose to Gilroy, connecting to VTA Light Rail at Tamien Station in San Jose. Microsoft Build is an annual conference event held by Microsoft, aimed towards software enginieers and web developers using Windows, Windows Phone, Microsoft Azure and other Microsoft technologies. First held in 2011, it serves as a successor for Microsofts previous developer events, Build 2011 was held from September 13 to September 16,2011 in Anaheim, California. The conference heavily focused on Windows 8, Windows Server 2012 and Visual Studio 2012, attendees received a Samsung tablet shipping with the Windows 8 Developer Preview build. Held on Microsofts campus in Redmond from October 30 to November 2,2012, attendees received a Surface RT tablet with Touch Cover, a Nokia Lumia 920 smartphone, and 100GB of free SkyDrive storage. Build 2013 was held from June 26 to June 28,2013 at the Moscone Center in San Francisco, the conference was primarily used to unveil the Windows 8.1 update for Windows 8. Each attendee received a Surface Pro, Acer Iconia W3 with a Bluetooth keyboard, one year of Adobe Creative Cloud, Build 2014 was held at the Moscone Center in San Francisco from April 2 to April 4,2014. William Bill Valentine, FAIA, is an American architect who has practiced at HOK since beginning his career in the St. Louis office in 1962. In 1970, he moved to California to help open HOKs San Francisco office, in 2000, he was named president and design principal of HOK and in 2005 he assumed the role of chairman. Valentine retired from HOK in 2012, after 50 years with the firm and he remains HOK chairman emeritus and lives in Mill Valley, California. Valentine received a Bachelor of Architecture degree from North Carolina State University and he is a Lecturer in Architecture at the Harvard Graduate School of Design. He is a leader for sustainability within the architectural profession. Valentine is a self-proclaimed evangelist for affordable net zero carbon emissions design, in 2009-2010, he led an HOK team that collaborated with The Weidt Group to create a market-rate, zero-emissions prototype design for a Class A commercial office building in St. Louis, Missouri. R&D Campus,1993 King Khalid International Airport,1983 Levi Strauss & Co, the Legend honor recognizes individuals whose lifetime achievements have contributed in a significant way to improving the practice of commercial interior design and architecture. Muni Metro is a light rail/streetcar hybrid system serving San Francisco, operated by the San Francisco Municipal Railway, a division of the San Francisco Municipal Transportation Agency. With an average ridership of 128,500 passengers as of the fourth quarter of 2014. Muni Metro operates a fleet of 151 light rail vehicles made by Breda, Muni Metro is the modern incarnation of the traditional streetcar system that had served San Francisco since the late 19th century. Recently, the system has undergone expansion, most notably the Third Street Light Rail Project, completed in 2007, other projects, such as the Central Subway, are underway. Muni Metro descended from the traditional streetcar system started on December 28,1912. The first streetcar line, the A Geary, ran from Kearny and Market Streets in the Financial District to Fulton Street, the system slowly expanded, opening the Twin Peaks Tunnel in 1917, allowing streetcars to run to the southwestern quadrant of the city. By 1921, the city was operating 304 miles of trolley lines and 25 miles of cable car lines. The last line to service before 2007 was the N Judah. However, five heavily used streetcar lines traveled for at least part of their routes through tunnels or otherwise reserved right-of-way, as a result, these lines, running PCC streetcars, continued in operation. The new tunnel would be connected to the existing Twin Peaks Tunnel, the new underground stations would feature high platforms, and the older stations would be retrofitted with the same, which meant that the PCCs could not be used in them. Hence, a fleet of new rail vehicles was ordered from Boeing-Vertol. The K and M lines were extended to Balboa Park during this time, on February 18,1980, the Muni Metro was officially inaugurated, with weekday N line service in the subway. The Metro service was implemented in phases, and the subway was served only on weekdays until 1982. The K Ingleside line began using the Metro subway on weekdays on June 11,1980, the L Taraval and M Ocean View lines on December 17,1980, and lastly the J Church line on June 17,1981. AECOM is an American multinational engineering firm that provides design, consulting and management services to a wide range of clients. AECOM has approximately 95,000 employees, and is number 156 on the 2016 Fortune 500 list, Fortune named AECOM as one of 2015 Worlds Most Admired Companies, and again in 2016 &2017. Engineering News-Record ranked AECOM as Number 1 Global Design Firm, the companys official name from 1990 to early January 2015 was AECOM Technology Corporation. Today, it is simply as AECOM. The company is listed on the New York Stock Exchange under the ticker symbol ACM and he gained control of some 200,000 acres and formed Swiss Oil Company in Lexington. In 1924 Miles launched an operation called Ashland Refining Company. In 1966 Ashland acquired Warren Brothers and became involved in the construction and construction materials business. The company was now able to take advantage of refinery byproducts used to produce asphalt. Ashland grew into one of the nations major road-construction firms and laid a foundation for AECOM. In the 1970s Ashland Oil & Refining became Ashland Oil, five years the company consolidated its construction assets into a construction division and formed a coal subsidiary, indicative of a changing focus at Ashland. Although it generated more than $1 billion a year in sales, by 1980 Ashland sold off its production assets, and a year was reorganized as a modified holding company. A new corporate strategy was implemented as Ashland now focused on refining and marketing, in 1984 Ashland acquired Daniel, Johnson & Mendenall, a global provider of transportation-related engineering services. Originally focused on projects, after World War II it had become one of the first integrated engineering. The acquisition of DMJM included its president, Richard G. Newman, AECOMs future chief executive, in 1985 DMJM became part of a new subsidiary, Ashland Technology Corporation. Two years Newman was named its new president, architects Ellerbe Becket and Davis Langdon, the quantity surveyors and construction consultants. 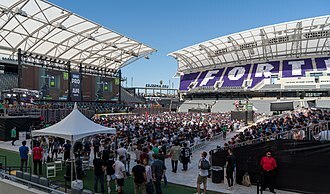 The Democratic National Convention is a series of presidential nominating conventions held every four years since 1832 by the United States Democratic Party. They have been administered by the Democratic National Committee since the 1852 national convention, the primary goal of the Democratic National Convention is to nominate and confirm a candidate for president and vice president, adopt a comprehensive party platform and unify the party. Pledged delegates from all fifty U. S, like the Republican National Convention, the Democratic National Convention marks the formal end of the primary election period and the start of the general election season. 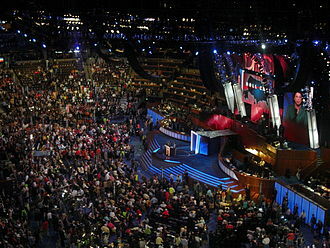 The partys presidential nominee is chosen in a series of state caucuses. Superdelegates, delegates whose votes are not bound to the outcome of a caucus or primary. To secure the nomination for the Democratic party in 2016, a candidate must secure 2,383 delegates and this number includes both pledged delegates and superdelegates. 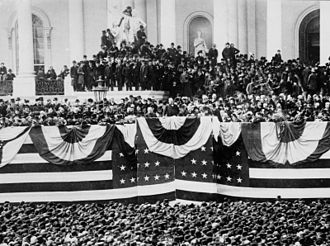 Prior to 1936, nomination for president was required, not merely by a majority, unless there was a popular incumbent, something that only happened three times between the Civil War and World War II, getting that many votes on the first ballot was implausible. The choice was a contentious debate that riled the passions of party leaders. Delegates were forced to vote for a nominee repeatedly until someone could capture a number of delegates needed. In 1912,1920 and most notoriously in 1924, the voting went on for dozens and dozens of ballots, backroom deals by party bosses were normal and often resulted in compromise nominees that became known as dark horse candidates. Dark horse candidates were people who never imagined they would run for president until the last moments of the convention, dark horse candidates were chosen in order to break deadlocks between more popular and powerful prospective nominees that blocked each other from gaining enough delegates to be nominated. The rules were changed to a majority in 1936. Since only one multi-ballot convention has taken place, before about 1970, the partys choice of the vice-presidential nominee was usually not known until the last evening of the convention. This was because the nominee had little to do with the process. Keith Allen Haring was an American artist and social activist whose work responded to the New York City street culture of the 1980s by expressing concepts of birth, death and war. Harings work was often political and his imagery has become a widely recognized visual language of the 20th century. Keith Haring was born in Reading, Pennsylvania, on May 4,1958 and he was raised in Kutztown, Pennsylvania, by his mother Joan Haring, and father Allen Haring, an engineer and amateur cartoonist. He had three sisters, Kay and Kristen. Haring became interested in art at an early age spending time with his father producing creative drawings. His early influences included Walt Disney cartoons, Dr. Seuss, Charles Schulz, in Harings teenage years, he left his religious background behind and hitchhiked across the country, selling vintage t-shirts and experimenting with drugs. He studied commercial art from 1976 to 1978 at Pittsburghs Ivy School of Professional Art and he made the decision to leave after having read Robert Henris The Art Spirit which inspired him to concentrate on his own art. Haring had a job at the Pittsburgh Center for the Arts and was able to explore the art of Jean Dubuffet, Jackson Pollock. His most critical influences at this time were a 1977 retrospective of the work of Pierre Alechinsky, alechinskys work, connected to the international Expressionist group CoBrA, gave Haring confidence to create larger paintings of calligraphic images. Christo introduced him to the possibilities of involving the public with his art, Harings first important one-man exhibition was in Pittsburgh at the Center for the Arts in 1978. He moved to New York to study painting at the School of Visual Arts and he studied semiotics with Bill Beckley as well as exploring the possibilities of video and performance art. Profoundly influenced at this time by the writings of William Burroughs, he was inspired to experiment with the cross-referencing and interconnection of images. In his junior/senior year, he was behind on credits, because his professors could not give him credit for the very loose artwork he was doing with themes of social activism and he first received public attention with his public art in subways. George Richard Moscone was an Italian-American attorney and Democratic politician. He was the 37th mayor of San Francisco, California from January 1976 until his assassination in November 1978, Moscone served in the California State Senate from 1967 until becoming Mayor. In the Senate, he served as Majority Leader, Moscone was born in the Italian-American enclave of San Franciscos Marina District, California. His father was George Joseph Moscone, a guard at nearby San Quentin. 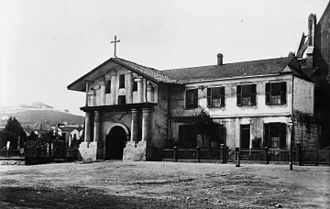 Moscone attended St. Brigids, and St. Ignatius College Preparatory and he attended College of the Pacific and played basketball for the Tigers. While in college, Moscone befriended John L. Burton, who would become a member of the U. S. House of Representatives. Moscone studied at University of California, Hastings College of the Law and he met and married Gina Bondanza, in 1954. The Moscones would go on to have four children, after serving in the United States Navy, Moscone started private practice in 1956. John Burtons brother, Phillip, a member of the California State Assembly, though he lost that race, Moscone would go on to win a seat on the San Francisco Board of Supervisors in 1963. On the Board, Moscone was known for his defense of the poor, racial minorities, in 1966 Moscone ran for and won a seat in the California State Senate, representing the 10th District in San Francisco County. This alliance was known as the Burton Machine and included John Burton, Phillip Burton, soon after his election to the State Senate, Moscone was elected by his party to serve as Majority Leader. He was reelected to the 10th District seat in 1970 and to the newly redistricted 6th District seat, representing parts of San Francisco and San Mateo Counties and he successfully sponsored legislation to institute a school lunch program for California students. In 1974 Moscone briefly considered a run for governor of California, as a heterosexual, Moscone was considered ahead of his time as an early proponent of gay rights. In conjunction with his friend and ally in the Assembly, Willie Brown, the repeal was signed into law by California Governor Jerry Brown. Moscone decided in 1975 to run for Mayor of San Francisco, in a close race in November of that year, Moscone placed first with conservative city supervisor John Barbagelata second and moderate supervisor Dianne Feinstein coming in third. Passengers boarding a YARTS bus at the Merced, California station operating as Amtrak California Thruway Motorcoach route 15 to Yosemite. Steve Jobs delivering the 2005 keynote address. Attendees at the 2004 JavaOne conference described their vision of the future of Java on a whiteboard.